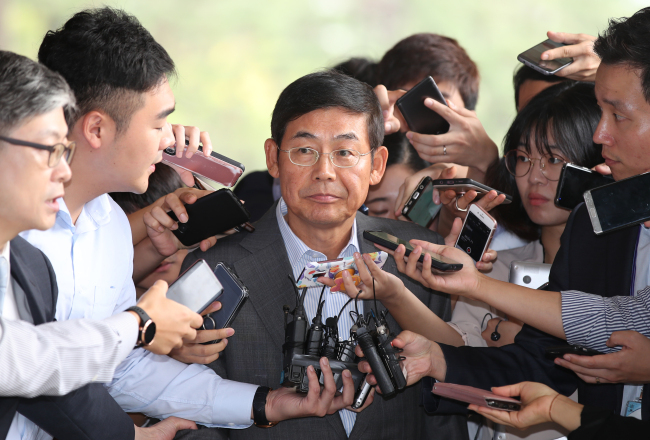 Prosecutors questioned the chairman of the board of directors at Samsung Electronics Co. on Thursday over alleged involvement in the scheme to hamper labor union activities at its after-sales services unit. Lee Sang-hoon appeared at the Seoul Central District Prosecutors' Office at around 10 a.m. He refused to answer questions from reporters. The 63-year-old is accused of engaging in an organized scheme to sabotage labor union efforts by Samsung Electronics Service employees in 2013. Lee was the head of the tech firm's management division when the labor union was being set up. Prosecutors have questioned at least several Samsung officials over their alleged roles in the sabotage plan, including a former vice president of Samsung Group's now-disbanded decision-making body, the Future Strategy Office.